This entry was posted in Uncategorized and tagged 23rd psalm, Atheism, Brooklyn Friends School, God by stephenbromberg. Bookmark the permalink. What a long strange trip it’s been…::))) Keep on writin’. I’m lovin’ it. Loved this story! It brought back so many memories. I, too, had Mrs. Watkins & remember her well. You’ve got me hooked Steve. Yours is now my read-first non-syndicated column! 🙂 ❤ Not being a mother, nor Jewish, I dare not even _breathe_ the word "synd…." Again nicely written and funny too. There’s a typo “lean” instead of learn. I have one thought and it’s the same one I have everytime you discuss the absence of “god” (small letters in deference to you) but only this time you let me know just how far back it goes. Nietzsche, famously declared God was dead in the 19th Century and man was on his own free. Ok, we learned from that. When you were 9 you learned that you didn’t have to have a god, later, that he was just a stuffed scarecrow, a bogey man in the sky, with no power on earth, no real place in the the things and laws of our lives. Ok, but you seemed to have philosophically rested there in that revelation since then. I want to tell you that this important revelation is not the end but the beginning and an essential step in the philosophical spiritual journey. No-god has a lot to reveal about who God is. Forgive an insufferable fool. Thanks for the heads-up on the typo, George. Self-editing and self-publishing can be frightening. I guarantee you I catch that if it’s someone else’s writing. Beyond that, I’ll forgive your insufferable foolishness. We really should meet up in church one of these days. It’s adjacent to the Willets Point subway station. Who’s gonna tell him, George? You or me? Sorry, couldn’t resist or wait. IRT 7 line stop, Queens, Shea and Citi Field. I should have guessed. As good a location for the faithful as one might choose, and no doubt a site where the fans are indeed faithful (as they are or can be at Fenway…). Although I may have picked the Village Vanguard first (devout musician that I am), yours is perfectly logical too. Would love to be a fly on the wall (no pun intended, really…) for that discussion. Steve, I will gladly pick you up at home and take you down. Just guide me to your favorite parking lot. Pick a day or two, seriously. I would enjoy that. Next month, George. You and I are going to visit the Church of St. Seaver. My third grade teacher wasn’t interested in our religion. It was wartime. She just instructed us to bring her ration stamps!! After parents protested to the principal, she not only needed our ration stamps, but a new job. 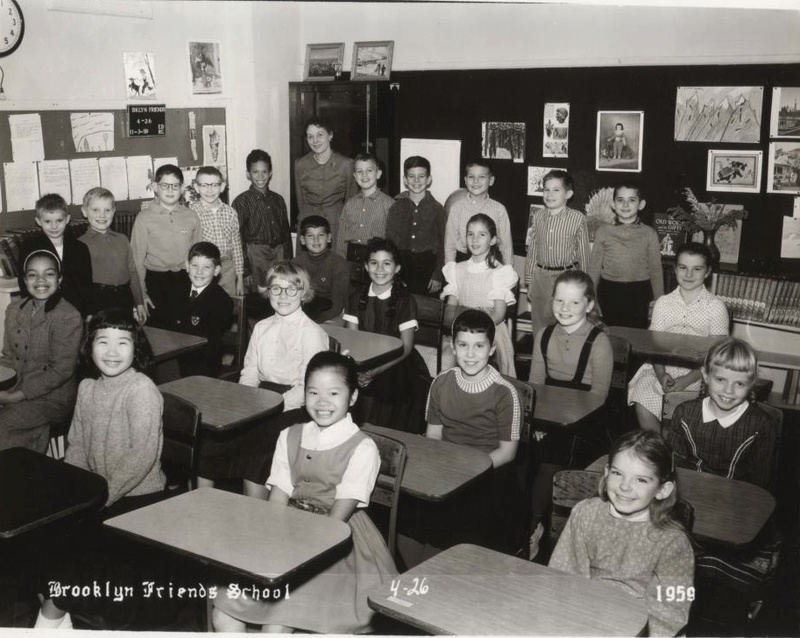 Fourth Grade was my first one at BFS, from which I graduated in 1953. I think Mrs. Watkins was the first person I ever heard with a Southern accent. I remember her telling the class that the way to get a hoot owl to stop hooting was to tie a knot in the corner of your sheet. As someone who had moved to Flatbush from Paris. I never had an occasion to test out whether Mrs. Watkins’ approach to shutting up local hoot owls really works. I had to take it on faith, like God or god or no-god. But I don’t recall Mrs. W. ever asking for our religions. A good thing. too. Even at 9-10 years, my classmates and I would have hooted at her. Somewhere, though, I still have a BFS promotion folder from back then saying the school “accepts selected Asians and Hebrews.” Much later, it started accepting “selected” Negroes, starting with kindergarten and First Grade and moving them up a grade at a time. When I entered the class of ’53, just three of us out of about 25 were “selected ” Hebrews. By the time I graduated. there were only six non-Jews left in the class. And about as many who weren’t sons or daughters of doctors or dentists. But along the way, my first Soviet was a classmate for a couple years — Svetlana Orson, the rolypoly little girl of a UN diplomat. Other classmates were the North Carolina daughter of the head of the FBI for NYC and the daughter of the ranking admiral at the Brooklyn Navy Yard. I gather BFS is back to non-Jewish diversity nowadays, but I kinda doubt ol’ Mrs. Warkins would get away with asking for kids’ relligions. Anyway, lots of us ’53 class Jews wouldn’t have described ourselves as such. Our group didn;t just include atheists. We were also mystics, potential Quakers, and would-be Marxists. Ben Burdsall, our very Quaker and conservative Head of Upper School not only tolerated all that, he actively defended our right to our opinions — against some McCarthyite teachers who wanted action against the “Communist cell” in our Tenth Grade year. When the parents of one of my classmates wound up in jail for refusing to testify to the House Un-American Activities Committee, Ben Burdsall told that student and his older sister in the senior class that he would cover their tuitions and that they should say if they needed any other help. I got to know him very well indeed later, when I became the editor of the school paper, “The Life.” for which he was the faculty advisor. And I’m quite certain he would never have asked any of us to state our religions. But, then again, he wouldn’t have needed to. With his tacit consent and that of several other teachers, we kids were very upfront about openly debating our various, and often shifting, belief systems. Fascinating, Ronald. Thanks for contributing. Ben Burdsall — The Burd — was head of Upper School when my class graduated in ’68. He was a much beloved man. He died a year or two later. I have no idea why Mrs. Watkins had us all “divulge” our religions to our classmates. For all I know, someone called someone else a bad name and she wanted to make a point. But the occasion did set me on a path. I have her — and my old pal Robert — to thank for that. Glad I’m not the only one kinda freaked out (er, would ‘non-plussed be more PC?) by the orthodox box hats and arm straps. Brought as Protestant (Congregationalist) and even with many Jewish friends surrounding me in all my formative years, I never experienced that until 1999 when attending an old friend’s daughter’s Bat Mitzvah in Atlanta. I wish I’d had an epiphany like Steve’s when I was 9 or so. It would’ve saved me a lot of zig-zagging on religion. I stopped going to church after delivering the sermon to First Congregational in Worcester (MA) as president of the youth group on Youth Sunday in 1968. When I became a dad at age 32, I felt compelled to inhabit church-going again, for the sake of ethical frameworking for the spawn (er, ‘offspring’…). It was a UU church (Unitarian Universalist). Highly recommended for anyone teetering on the edge of caring about religion. They make the valid point that spirituality and religion are two different things. One is within you in its various forms, and the other one is external and hinges on belief systems. Since getting a boat in 2004, we’ve given up church again. Spirituality is all over the place on the ocean and environs.